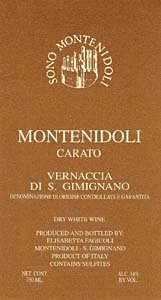 At Montenidoli Vernaccia has always been considered the red of white wines, because of its body, the climate from which it springs, and its ageworthiness. Its secondary aromas, which develop with time, are one of its strong points. Fermentation: The free-run must, which expresses the terrific elegance and finesse of the varietal. The must flows naturally from the grapes that break because of the pressure of those above them in the press. It ferments in steel and ages long on the lees to gain roundness and persistence. 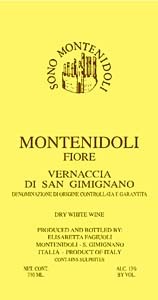 Food-Wine Pairings: The most elegant expression of Vernaccia di San Gimignano. Well suited to delicate dishes with cream sauces, steamed fish, and delicate fish such as sole, whiting, or brook trout. Perfect with fish mousse or soufflé, and white meats including chicken breast, turkey breast, or milk-fed veal. Fermentation: The free-run must from the best vineyards, which ferments in barrels and ages on the lees for 12 months. Wood contributes to the complexity of the secondary aromas, developing, over time, a richness of flavor and taste that brings to mind citrus and honey. Food-Wine Pairings: Perfect with cheeses or richer dishes. It is also ideal for the evening, refreshing the palate after the fuller reds of an important meal. 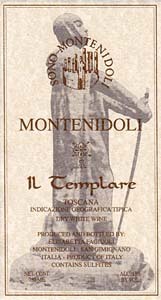 From the tastes and customs of those who lived at or live at Montenidoli, made from the Vernaccia and Chianti grapes that have always been grown on this land. Fermentation: The great white wine of the warrior monks of the middle ages, to be drunk, says the Rule, "as needed to distance the cold." From Vernaccia, Trebbiano, and Malvasia grapes fermented in old barriques, in which it ages for 12 months. Food-Wine Pairings: A classic Tuscan white wine, perfect with molluscs and crustaceans, and also with stock fish, sword fish, tuna, and the other great fish of the high seas. Fermentation: The free run must from the Trebbiano and Malvasia grapes in the Chianti vineyards. 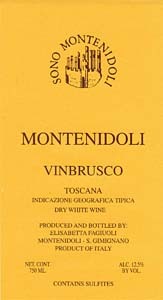 It's the white wine traditionally drunk by the farmers of San Gimignano. It ferments in steel and ages on the lees to acquire body and softness. Food-Wine Pairings: Perfect with Tuscan dishes and vegetarian foods, softens the spice of Indian foods and the fire of Mexican, works well with saffron, and with Thai flavors. Fermentation: From red-stemmed Canaiolo grapes with the aromas of white grapes and the richness of red grapes. A free-run must that ferments slowly, and is bottled as soon as the sugars have fermented, to maintain its freshness. Food-Wine Pairings: The perfect aperitif, if possible in a Champagne flute. A delicately colored rosé with floral aromas, full soft flavors, and a savory finish. 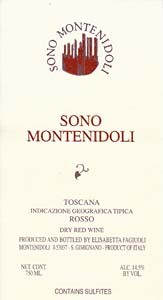 Montenidoli's red wines reflect the characteristics of their terroirs in their intense, clean dry flavors, displaying personalities that won't fall under the sway of current fashion. 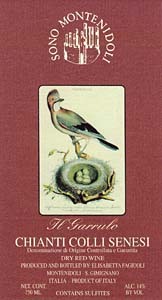 Fermentation: The two red grapes and the two white grapes specified in the old Chianti regulations, after the formula developed by Barone Ricasoli. It ferments on the skins, with a long maceration in tank. A savory wine with a rich nose, soft, and with a long finish. Food-Wine Pairings: Perfect with tomatoes and thus ideal with many Mediterranean dishes. Ideal for barbecues and with grilled fish, meats, of vegetables. A wine for every occasion, light on the palate and pleasant to drink. after one year to preserve its vibrant youth. A bright, brilliant red, with a fresh clean nose. In the mouth it is lively and exuberant with a tough, long aftertaste. duck, pheasant or ham and salami. 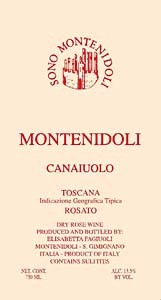 Fermentation: The finest bunches of Sangiovese from Montenidoli's vineyards: after macerating in tank, it ages for 12 months in barriques and for at least three years in bottle. Its power and tightness reveals it youth, and it has a long future ahead of it. Food-Wine Pairings: Its fullness and structure make it perfect for special occasions. With game, braised dishes and red meats. It is a cure for all depressions of body and spirit. 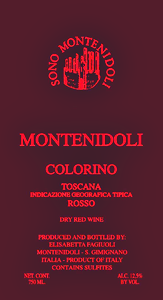 The vines of Colorino were planted at Montenidoli in 2006. 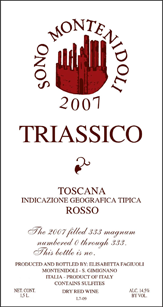 Tuscan tradition blends this variety with the grapes of Chianti in order to give colour. 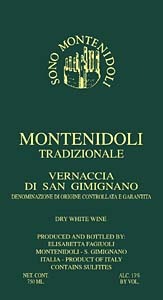 At Montenidoli it is fermented by itself. After a long maceration on the skins it matures for 12 months in barrique and is bottled to be ready to drink. Deep ruby, inky aromas, soft and gentle on the palate, an immediate, eminently approachable young red wine. Wine-food pairings: appetizer, sliced ham and salami, a good companion to a light lunch. The vines of Sangiovese were planted in 2001 right in the heart of Montenidoli, in the cru PRIMO SOLE, surrounded by the woods. 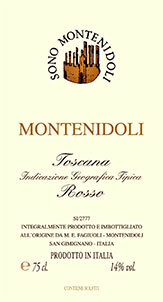 The red soil of the Trias on cavernous rocks gives to this Tuscan Sangiovese a very special and unique taste. After a long maceration on the skins it matures for 24 months in French barrels and is bottled in magnums, where it rests for refinement. Wine-food pairings: for special occasions as it is a ruby red with rich aromas, a unique taste and long finish. The earth that puts people, creeds, races together. An attempt to bring nearer different cultures and dogmatisms in order to go beyond, towards a more free and clear vision of brotherhood. 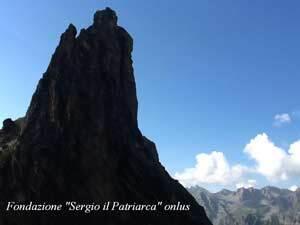 To cultivate the earth is first of all non-violence and the capacity to listen to her message through the plants and the animals, saved from any chemical poison. Our way of looking at the Foundation is simple and direct as has always been the life of peasants.